We are pleased to announce the 2018 Global Week of Action Against Gun Violence will be held from May 7 to May 14, 2018! 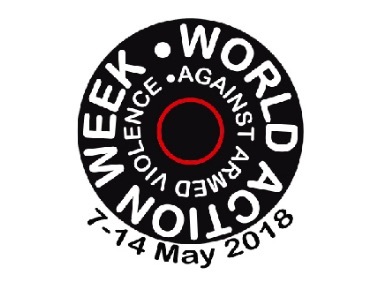 Launched by IANSA in 2003, the annual Week of Action (WoA) is a chance for us to advocate collectively for an end to illicit trade and misuse of small arms and light weapons. The logos for this year’s Week of Action can be found in English, Spanish, French and Portuguese here. For a report on activities carried out last year, click on this link. Our briefing papers, including “What is RevCon3,” a “Global Overview of the Small Arms Problem, “The Programme of Action on Small Arms: Incomplete without the Inclusion of Ammuntion”, “Civil Society Advocacy Guide,” and “Five Key Issues for RevCon3” can be found here. Our video “Silencing the Guns” can be found here. We are grateful for your upcoming contributions and look forward to this meaningful week of activism! If you have any further questions, please contact me at rose.welsch@iansa.org.